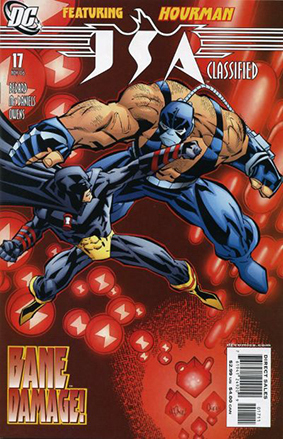 • JSA: CLASSIFIED #17 "Bane Damage"
• PLOT SUMMARY: Written by Tony Bedard. Art by Scott McDaniel & Andy Owens. Part 1 of "The Venom Connection," written by Tony Bedard with art by Scott McDaniel & Andy Owens (GREEN ARROW)! Bane attacks Hourman in his home to get at the drugs that can keep him at full strength!